I ended up in Toulouse in southwest France almost by accident, but loved every minute. This great city is small enough to walk around in, yet big enough to offer great food, shopping, music and theatre. And it’s old enough to be architecturally magnificent, from its churches to its bridges. Half-way between the Atlantic and the Mediterranean and just north of the Pyrenee mountains, France’s natural border with Spain, Toulouse is the gateway to some of the world’s finest wine, think “black” Cahors, Bergerac, Gaillac. It’s also a centre of Europe’s aerospace industry. The “rose” city, named for its red brick, is even pleasant when it rains. Here are some highlights from my two-day visit in June. Toulouse is famous around the world for cultivating the little purple flower you may remember from your grandmother’s house. 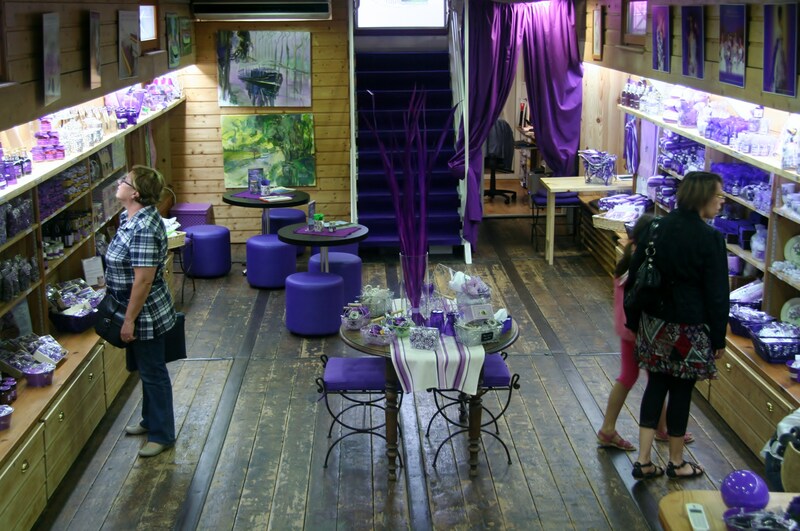 Maison de la Violette, a barge anchored on the Canal du Midi, sells all manner of violet souvenirs. Below deck you’ll find dainty candied violets, violet jam, liqueur, mustard, bath products and much, much more! When the weather’s fine, the upper deck becomes a tea room. At this rustic 42-seat restaurant, housed in an ancient watchtower, you serve yourself and even put away your own dirty dishes. Despite the DIY vibe, reservations are a must. Sit down at a long communal table and great bowls of salad appear for sharing, along with pitchers of the dark, easy-drinking local red wine called fronton, or negrette. The table’s soon laden with curried lentils, soft-boiled eggs floating in olive oil, grated carrot and beet salads, chicken liver pâté and a tangle of shredded cabbage and bean sprouts in a soy vinaigrette. After polishing off the appetizers, pick up one of the mismatched plates from a tall cupboard and troop over to the old stove by the window for the day’s main courses, perhaps stuffed tomatoes and rabbit confit nestled in baking pans and casserole dishes. Soup and thick loaves of bread sit on a table beside the fireplace, ready for slicing, and desserts beckon from another table – brownies, bread pudding, banana bread and poached apples and pears. End your meal with the best espresso, which friendly owner Jerome Navarre sources from India. A prix-fixe lunch costs 15 euros (about $20), and dinner is about 20 euros. Wine is extra and dinner reservations are a must. Toulouse is like a mini Paris for shopping, with a branch of the famous Galeries Lafayette department store and plenty of hip boutiques you won’t find at home. I bought a chunk of handmade apricot soap at Le Comptoir des Savonniers, and looked in the window of the exquisite La Fleurée de Pastel, celebrating the plant with yellow flowers whose leaves release a soft pastel blue dye renowned throughout Europe. 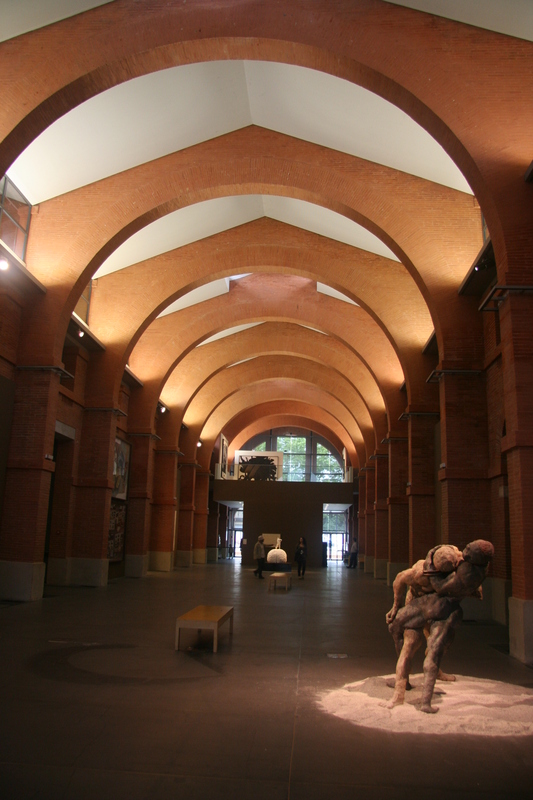 Toulouse has transformed a former slaughterhouse into a spacious contemporary art museum, easily reached on a walk from downtown along the Garonne River. The museum’s permanent collection includes a wall-sized work by Picasso, and the various exhibition spaces display contemporary artworks that promise to confront, challenge and inspire. There’s a fresh food market or three open every day of the week in Toulouse, but the most posh is Victor Hugo, where Champagne sells by the glass. In the main hall, chic stalls transform raw food into art. At one stall, butchers cut beef cojones. At Betty’s cheese shop, Betty herself serves customers from behind a glass counter. Find the finest foie gras for your cassoulet. Stop at the Lavazza café and learn the lingo: a café will get you an espresso, a crème is a single latte; grand crème is a double. Noisette is an espresso macchiato. 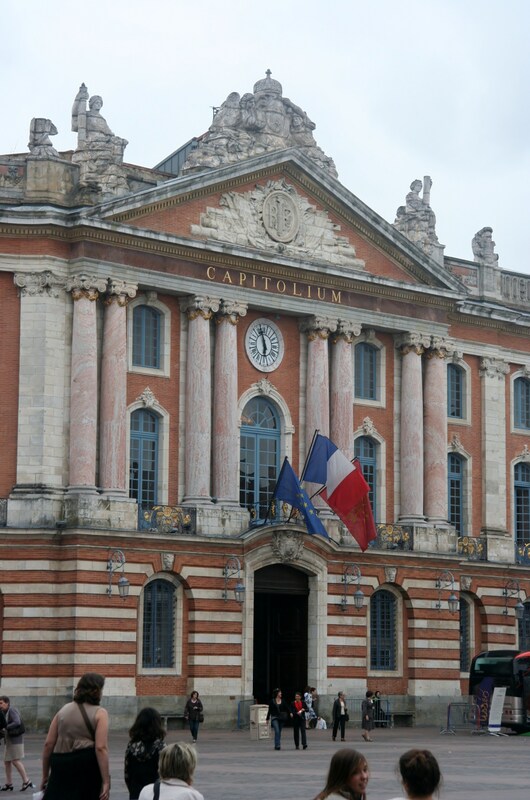 Day or night, there’s always something happening in this vast square in the centre of Toulouse, surrounded by handsome brick buildings that glow a pinky red, making Toulouse the “rose city.” Today the Capitole houses the city hall, as well as a theatre for opera and the symphony. Inside the town hall, a grand marble staircase leads up to the Salle des Illustres, a sumptuous Baroque hall, its walls and vaulted ceilings covered with elaborate paintings and frescoes. In the 1800s, local artists were asked to decorate giant panels representing every stage of life in the magnificent marriage room where civil ceremonies were held. The fresco representing 20-somethings in love shows a woman with plump firm breasts, while the 40-year-old couple in the next fresco look painfully platonic. The panel representing the 60s shows an armoured man on horseback being welcomed back from war by his faithful wife. This annual music festival held in the park along the river is one of many summer cultural events happening in Toulouse. International bands of every musical style gather in mid-June to play until midnight. The mood is friendly and relaxed, and participants wander freely with a beer in hand. Tents sell food from every country – Latin empanadas were particularly popular. Like all French food, it all smelled delicious. The 2017 edition takes place June 15-18. Seeing the biggest passenger airplane in the world, the A380, under construction in its vast hanger makes this visit a thrill for young and old. From the darkened telemetry room, where the tour begins, a video shows the giant bird’s inaugural flight in 2005. You can even hear the pilots’ cockpit conversations. Our serious but knowledgable guide went to great pains to explain the exhaustive testing the 850-seat plane has undergone to ensure it’s safe. At one point, she said, the company filled an A380 with staff posing as passengers, locked half the exit doors then ordered an evacuation. Within minutes, everyone was out. The two-storey plane has an 80-metre wingspan and is fitted with 500 kilometres of electric cables, she said. Planes under construction in the giant hanger below the viewing window are a patchwork of green and white. Green represents aluminum alloy, one of the light new materials being used, and the white sections are carbon fibre. Once the plane’s painted, passengers won’t notice the difference. Even with more seats, the lighter materials allow the giant bird to use less fuel. Airbus is currently working on burning less than 2 litres of fuel per seat, per 100 kilometres, she said, and passengers will have 50% more room. 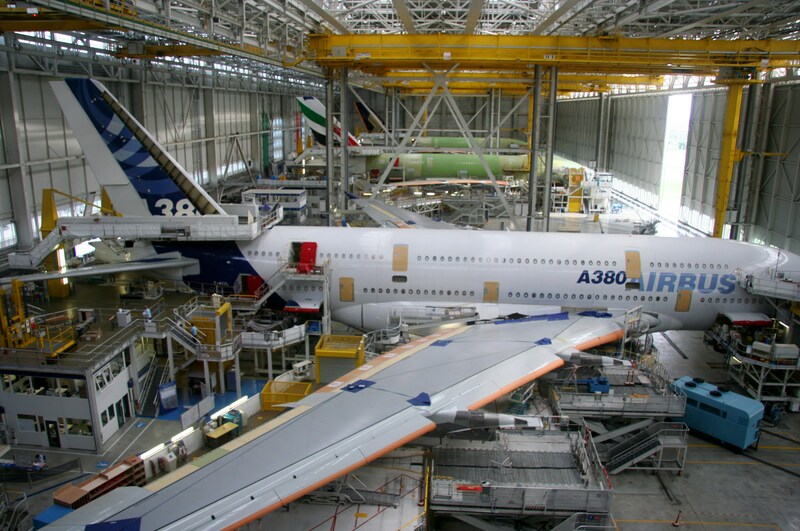 If you’re looking to buy an A380, Airbus won’t be able to start on it for at least six years. The United Arab Emirates alone has ordered 90 of them, she said. Airports around the world, meanwhile, are making space for the big birds. The fun part of the tour is visiting the mock-up cabin interior, which smells like a new car. Here’s where the purchaser gets to customize the interior of their new baby, choosing the colours, upholstery, even the configuration of the seats. Lucky first-class passengers on Singapore Airlines are getting mini suites and king-size beds, while Emirates’ best customers will have private showers, Air France is building an in-flight art gallery and Korean Air is building onboard duty-free shops. Thanks for such a wonderful informative review. Hi Cynthia, I’m here at this moment!! Am staying on a Peniche in the canal du midi!